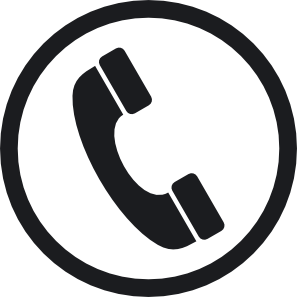 Our extensive Audit Tool is provided by e mail or on a Disc. 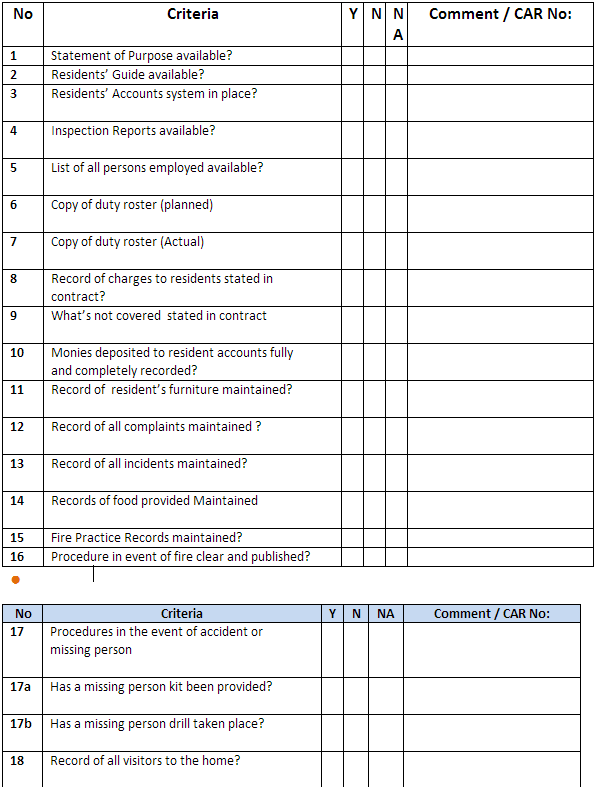 The Risk Assessment Procedures are based on HIQA requirements to carry out clinical risk assessments. 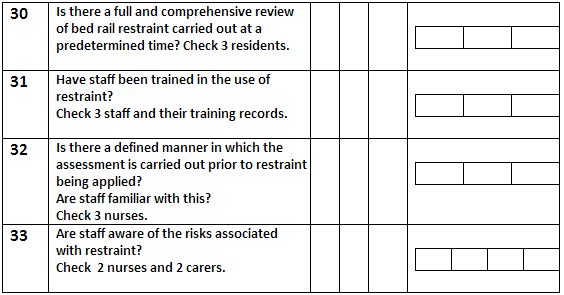 Our Clinical Risk Assessment Tool provides the carer with an indebt analysis and solution to problems with high risk residents. 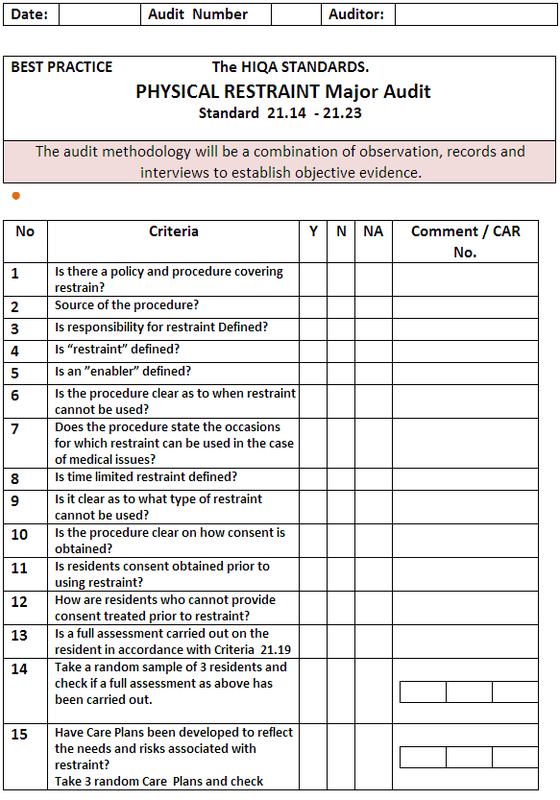 It takes up the care planning where the resident has been identified as being of high risk by the more commonly used assessment tools such as “Mini Mental”, “Canard” , “Waterlow” etc. 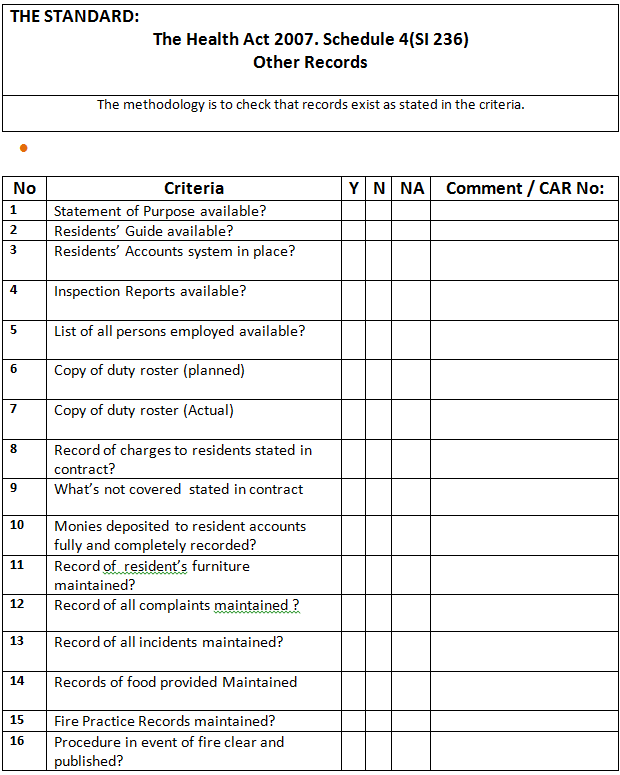 Once the resident has been identified as being of high risk our tool kicks in and provides the carer with all the information they need to develop relevant and appropriate Care Plans, thus ensuring that the resident receives the maximum possible care. 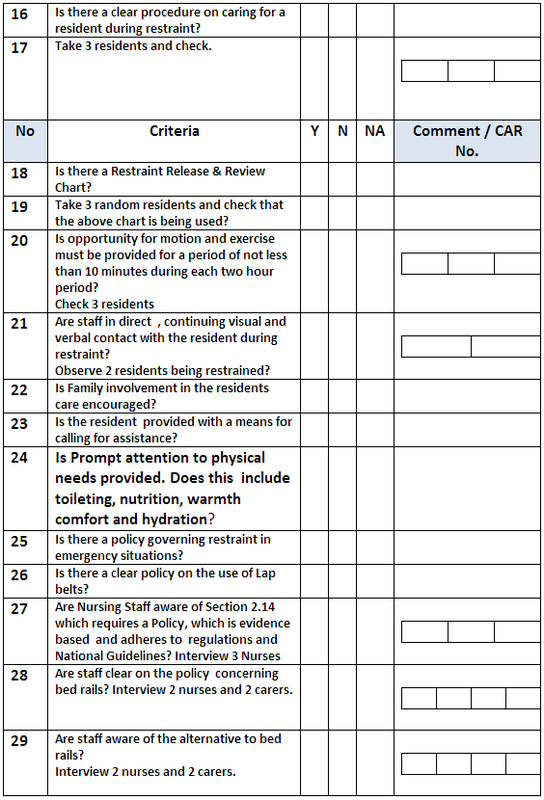 The 22 risks are regarded as the key clinical risks to residents in a nursing home. 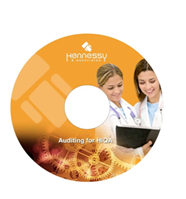 Hennessy & Associates have an outstanding reputation for providing exceptional and first-rate Policies and Procedures. 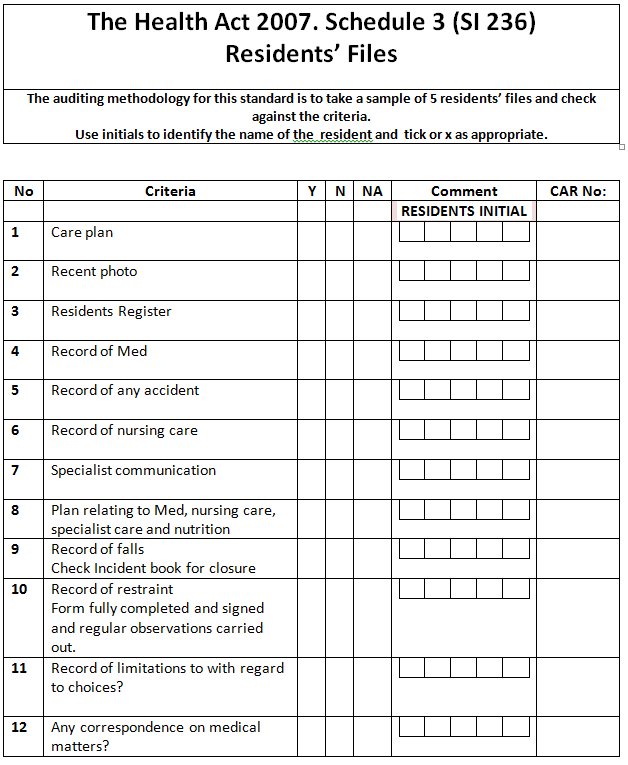 Procedures are essential for standardised delivery of care and service in the nursing home and is a legal requirement for maintaining centre registration. Procedures set out the correct manner to carry out important care processes in the home. The procedure identifies who, when, what, how and where. The need to understand your processes is core to the provision of a safe and high quality service. By documenting the processes in the form of policies and procedures staff can be trained and understand different aspects of each process. Hennessy & Associates can provide, up to date, the “Schedule 5” Policies and procedures as required by the Health Act 2007. In addition we have a library of Policies and Procedures concerning many aspects of care and nursing home management. We can provide procedures in a generic form or we can tailor them to your specific need. All our clinical procedures are evidence based and will be provided with a full bibliography supporting their provenance. Apart from the Schedule 5 Policies and Procedures, Hennessy & Associates can provide, for example, the following P&P’s.